Ulster University hosted a Celebration for the 2016/17 Code Academy cohort on Monday 20th November 2017 at the Jordanstown Campus. This was a night of celebration for those who completed the course joined by friends and family to cheer them on. 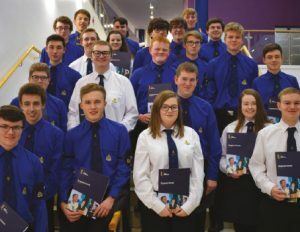 Seventy young people from various BB companies in NI successfully completed the course. Code Academy has been run over the last 3 years, in partnership with Ulster University School of Computing and Mathematics. It is an introduction to Computer Coding using HTML and CSS, to create, design and develop a website. A hot fork buffet was served on arrival followed by some words of congratulations and encouragement from Dr Raymond Bond and Professor Chris Nugent both from Ulster University, before the Code Academy Certificates were presented. Special awards were presented to Daniel Lowry (76th Belfast), Philip Paul (1st Kilrea), and Kieran Minto (4th Ballymoney) for the determination and effort they displayed during their Code Academy course.